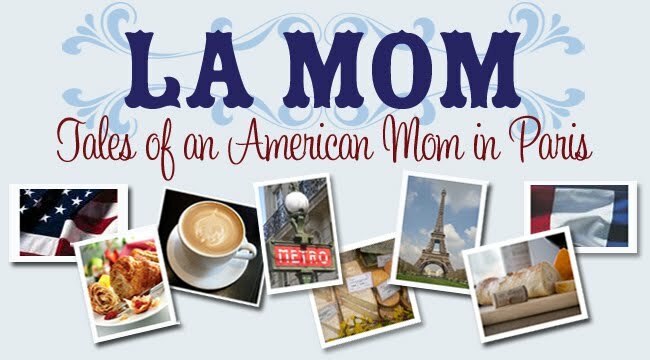 La Mom - an American mom in Paris: Happy Mardi Gras! It’s Carnaval time in France. The French Fries headed off to school today dressed up in their recycled Halloween costumes and crèpes for class parties. Why not throw a little Mardi Gras party of your own with a Galette des Rois? Yeah, yeah, I know that the French celebrate Epiphany on January 6th with these yummy cakes. But in New Orleans, everyone eats King Cakes at Mardi Gras – and whoever finds the “favor” is king for the day. Mmmm...cake. S comme Small Fry! Line a pie pan with one pastry crust. Prick all over with a fork. Mix all of the remaining ingredients together (except second pastry crust). Pour mixture into pie pan and top with second crust. Using a paring knife, make small decorative scoring incisions in the crust. Brush with beaten egg. Cook in a pre-heated oven for 45 minutes at 180°C/350°F. When cake has cooled, lift up a layer of the puff pastry and gently insert a bean (the original French “fève”) or a real Mardi Gras favor. Le Carnaval isn’t a big deal in Paris. But check out Carnaval in Nice or Dunkerque if you want to see where the action is! Happy Mardi Gras to you too! I was blog-hopping and found your site. I'm also a New Orleans lady, transplanted to Shreveport, LA. (no real Mardi Gras here). I miss the beignets at the French Market and the nuttiness of Mardi Gras (minus the drunks). I became a follower so I can visit back and get the Paris French news. One of the french bakeries here is doing a mix between a New Orleans King's Cake and a French Galette des Rois. US shape, French taste + feve instead of plastic baby. ie. the best of both! I have yet to make my own galette (though I made a kig's cake this year) so thank you for the recipe. I might it some day! @French Twist DC Yum! That really must be the best of both worlds. Belle-mère's recipe is surprisingly easy. Once I figured it out, I never bought a 35 € galette again! @ANGIE Good to see you here! Paris news, I don't know...but you'll get the Paris dish for sure! Oh my! Thank you for this recipe. When I was growing up in France my mother would always buy this cake for us and it was so much fun to see who would find the little king inside the cake and get to wear the crown. I wanted to do this tradition for my kids but the king cakes in this country are nasty sugar glazed cakes with bright colored frosting. Worse yet there was no king hidden inside nor the paper crown!! Not nearly as much fun. I am going to make this cake but alas too late for my kids since they are 31 and 33 LOL! Maybe I can start this tradition for my grandson since I am trying to bring him up bien Francais. He already says OOOO LALA! Thanks so much for posting this recipe!! I've always thought about attempting to make a Galette des Rois! Miss you and Paris! Thank you for sharing this recipe. I've never made this before, but I've always wanted to try. Robes was married to a Cajun, and we know how to DANCE>>>>> So I get it.We may try it......It looks delish. A one gazillion calorie galette? Yes, please!